This is the General Grant Sequoia Tree from our trip to Sequoia National Park and King's Canyon National Park in 1998. The tree was named in 1867 after Ulysses S. Grant, Union Army general and the 18th President of the United States. President Calvin Coolidge proclaimed it the "Nation's Christmas Tree" on April 28, 1926. Due in large part to its huge base, the General Grant tree was thought to be the largest tree in the world prior to 1931, when the first precise measurements indicated that the General Sherman was slightly larger. On March 29, 1956, President Dwight D. Eisenhower declared the tree a "National Shrine", a memorial to those who died in war. It is the only living object to be so declared. 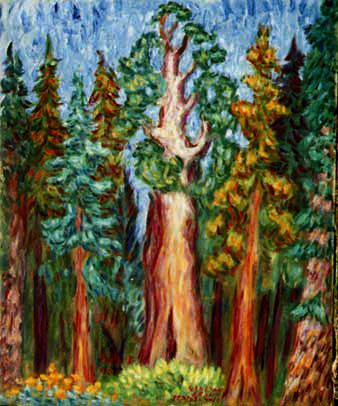 PaulB's Pointillistic/Impressionist original oil paintings of Sequoia National Park and various prints and poster formats of a wide variety of subject matter by the Pointillistic/Impressionist oil painter from landscape/waterscape paintings, dance, sports, portrait, to classical figures, flowers, rock and roll, Brazil, and Sequoia National Park paintings and prints are available for purchase for as little as $24.95 for an 8" x 10" matted print on photo pape. Pointillistic/Impressionist Giclee prints of Sequoia National Park on real canvas or heavy watercolor paper are available. One of a kind Sequoia National Park embellished prints, which are Giclee prints retouched in genuine oil paint by PaulB. Unless noted PaulB's original Pointillistic/Impressionist oil paintiings are oil on canvas. Paul Berenson's pointillistic/Impressionist oil paintings are in privale collections around the world, including the downtown Los Angeles Athletic Club and have appeared in numerous publications, including the New York Philharmonic Playbill. PaulB.com also builds websites and PaulB is a member of the LA Web Professionals Group.